Born: July 31, 1853 in Sandwich Ma. 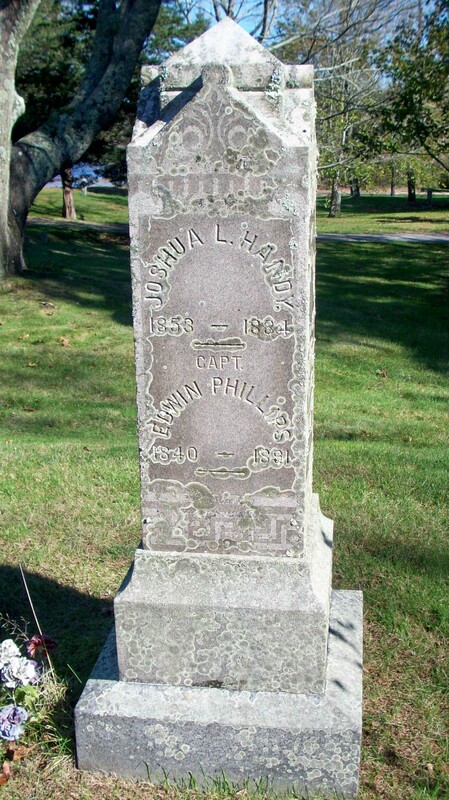 Died: October 30, 1884 in Bourne Ma. at 31 yrs, 3 mo. Married: November 6, 1878 in Sandwich Ma. To: Annie DeWitt Bourne; (1853 – 1932) (Benjamin Franklin Bourne & Elizabeth Wheaton Lincoln); Annie married (2) Edwin Phillips, Capt. (1840 – 1891) (Stephen Phillips & Lurana Chase) in Bourne Ma. on March 6, 1890; Edwin married (1) Josephine Taylor (1844 – 1898) (Ezra Taylor & Abigail Baker) in Harwich Ma. on February 18, 1859. 1. Richard Clifton Handy; (1880 – July 23, 1948); Married Elsie Simpson (1889 – 1950) (William Simpson & Martha A. Laws) in Wareham Ma. on May 12, 1910; Richard was a member of Bourne High School Class of 1896; They had 4 children; Richard & Elsie are buried in Oakland Grove Cemetery in Bourne Ma..
2. Helen M. Handy; (December 31, 1880 – January 29, 1881); Helen is buried in Cataumet Cemetery. 3. Edith Florence Handy Nickerson; (1880 – December 3, 1969); Married Edward Drew Nickerson (1880- 1978) (Herbert D. Nickerson & Caroline R. Drew) in Bourne Ma. on November 13, 1900; Edward married (2) Jennie Lillian Marvill (? – 1935) in Bourne Ma. on January 1, 1926; Edith is buried in Cataumet Cemetery.